My eight-year-old daughter has been using an old Windows XP laptop. My concerns for parental guidance and family control would be better served on a Windows 7 or 8 laptop. 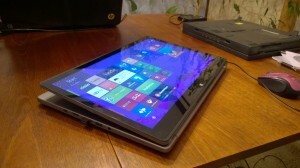 A Windows 8 machine would move her into the latest touchscreen technology. I’d started shopping with the idea of getting her onto a new Windows 8 laptop sometime around XP’s demise. 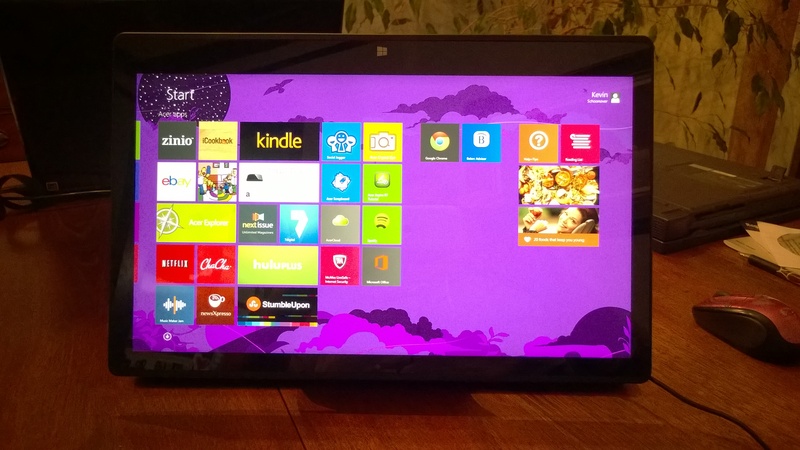 Windows 8 became an easy choice as she had no issues using the touch interface and understanding the gestures. 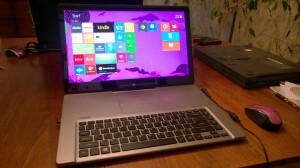 Things I wanted in a new laptop for her were Windows 8, touchscreen, 15 inch screen, light and thin as possible. I thought about some of the Lenovo Flex options by kept coming back to the Acer R7. For those of you who have played with a R7, it has a unique hinging mechanism. It was fairly well beaten up by the reviewers because of the touchpad placement. As I looked at the ability to move the touchscreen to several positions, the touchpad placement really wasn’t an issue because my daughter tends to use a mouse. My thought was with the excellent keyboard placement of the R7 and the touchscreen; she may not need the touchpad at all. 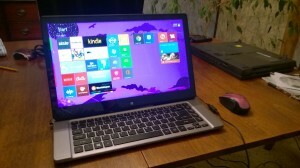 Purchasing new, the R7 is a fairly expensive system with its 15.6 inch 1080 full HD screen and i5 CPU. It tends to run around $900. Woot has become one of my favorite places to buy refurbished equipment and the Acer R7 has come up often on Woot at a sub $500 price. Recently I took advantage of jumping on one of these because I think it will make a great laptop for my daughter, but it will also give me a chance to review a refurbished piece of equipment. I often recommend refurbished equipment and frankly it’s been a while since I’ve actually bought some for myself. The R7 arrived in perfect condition with all the accessories in an Acer refurbished box. There are no scratches or noticeable marks anywhere on the system. It looks like new and is literally perfect looking. Due to the thin profile of the R7, there is no built-in DVD player and no built-in Ethernet connection. You must rely on wireless Ethernet. It does have USB and USB3.0 ports in addition to having a mini display port and HDMI ports. Straight out-of-the-box the system came up and was working fine loading and updating, but then I ran into an issue. A friend of mine has a R7, so I was aware that there were issues with the Wi-Fi on the system. Some of the Wi-Fi issues have been taken care of through a driver update from Broadcom. I should have updated the driver immediately, but I did not. This caused a few Wi-Fi fallouts and when Windows 8 is installing if it does not have a clean path to the network it wants you to load on a local account. Later this can cause you a few problems with the Windows store. This is not so much an issue with the device. This can be an issue with any Windows 8 machine. Make sure you have a good clean network connection and that you’re able to log into a real Microsoft account to keep your install functioning as smooth as possible. I did all the updates to Windows 8 to the point of jumping to Windows 8.1, and now 8.1 update 1. Everything is working extremely well. I turned the R7 over to my daughter, I literally explain to her that there are two different worlds within Windows 8, one is the pretty Metro screen and the other is a traditional desktop like her old computer. I taught her to swipe in from the sides, top and bottom when she needed to find things. That literally is the last time I had to explain anything about Windows 8 to her. She has had no problem adapting to it and using it. Jumping from Windows XP directly to Windows 8 has not been an issue for her. Yes, that is a USB microscope in the first picture. Another Woot deal! So far so good, no problems with the refurbished system, I will keep updating this post. If any issues do arise I will report them. So far I’m very pleased with the system I would have to say for a good average 15 inch laptop costing $400 – $600 getting this system with its outstanding screen and other features for around $500 has been a pretty incredible value. Family Safety was available in Windows 7, as Windows 8 requires a login, Family Safety is easy to implement on Win 8. In FS you have the ability set the amount of time they can be logged in and the apps they can use. With the design of this system it could also be a very good AIO/Family computer.I will try to give regular updates on the R7, more of a long term experience with the system. Let me know if you have any questions. Post them in the comments below. Great review for sure! $900 would be a bit much the the woot! deal would make it more palatable. The only issue for me is the hinge that stops it from actually being flat as I would break that in a heartbeat. Again, nice job!